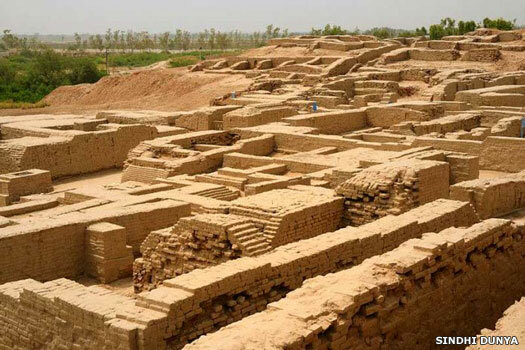 As the first great civilisations took shape in Sumer and Egypt, a people of unknown origin who were centred in the Indus Valley in modern Pakistan and India began constructing their own series of cities. These were as remarkable as any the world had yet seen, and at the same time trade flourished, and a system of writing evolved. At its height, the Indus civilisation encompassed nearly 1.3 million square kilometres; its boundaries stretched from the foothills of the Himalayas to the Arabian Sea and from the Ganges watershed to the Gulf of Cambay. Unfortunately, the full story of the development of this civilisation is extremely elusive. Their pictographic script has yet to be deciphered. Many of the carved stone seals carry stamps which serve as property markers (some of these have been found in Mesopotamia), and each seal also bears an inscription in pictographic characters which do not correspond to anything known from the other early civilisations. The Indus people left no surviving histories, religious texts, literary epics, or king lists. No kings are known from any other sources (and no palaces have been found), but there was a priesthood which may have played a role in governing the civilisation. The earliest known inhabitants along the Indus Valley are nomadic herders from the hills of Baluchistan, not far to the west. Their stays in the valley are seasonal. By the mid-fourth millennium BC the pattern begins to change, with some families planting small garden plots. This develops into more permanent communities which remain in the valley all year round. One of the earliest is Amri, on the river's lower reaches; a single tribal group which encompasses twenty villages. One of the earliest cities to form begins modestly in about 3300 BC as a village on the banks of the Ravi, a major tributary of the Indus in eastern Punjab. The city comes to be known as Harappa, and it gives the civilisation its name. The city of Mohenjo-Daro ('Hill of the Dead' in Sindhi), is built and is laid out almost identically to Harappa. The civilisation reaches its height at this time. Trading posts are established far beyond the valley's fringes. One such settlement is at Sutkagen Dor, west of Baluchistan and within reach of the Persian Gulf. To the south of the valley, a large sea port is located at Lothal on the Gulf of Cambay (in the modern district of Ahmedabad). Trade routes from there to Sumer and Akkad are established from this date. 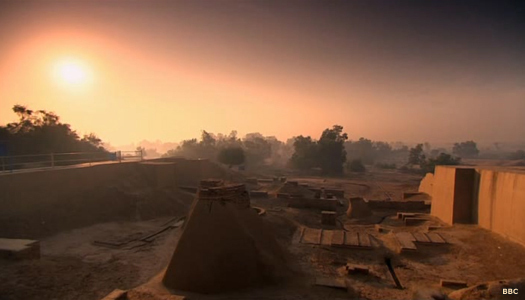 At the height of its civilisation, Harappa is home to 35,000 people. The civilisation endures without perceptible change for the following four centuries. Its territory expands east towards the Ganges and south into Gujarat, where new cities such as Dholavira are founded. The beginnings of decline can be seen. Mohenjo-Daro is abandoned around this time. The Cemetery H culture begins to emerge out of the northern part of the Indus Valley civilisation (which includes Harappa). This culture can be linked to the Indo-Aryan migrations, but can also be claimed as a late expression of Indus Valley culture. Possibly its a combination of both, with refugees from the Indus collapse joining the Indo-Aryan migration. In this century the cities slip into terminal decline. No one cause seems responsible, but a combination of climate change, over-cultivation, and changes in the course of the Indus may contribute. The weakening of the monsoon is probably the most important single cause. Scribes in Sumer record that rich shipments suddenly cease at around 1800 BC. The Indus culture dies out. Its people move east into Rajasthan and the Ganges watershed. Others head south to Gujarat, where the sea port at Lothal continues to flourish for a time before being abandoned too. Its inhabitants merge with the Stone Age tribes of the Deccan plateau in central India and others in southern India. Squatters take over the abandoned citadels, living in slum dwellings, and village life continues in the countryside. The urban heritage is passed on to the east and engenders the emergence of cities in the Ganges valley and northern India, and the civilisation's reverence for animals is also passed on. Due to the same climate change which ends the Indus Valley culture, the small, settled populations of Central Asia have recently begun to mobilise, notably from the area of modern Turkmenistan. Tribes of riders from the Iranian plateau have begun infiltrating the Baluchistan hills at this time, and they may well merge with village cultures. Indo-Aryans soon begin to drift in from the west, eventually to form their own states. In time, the Sindh region of the southern Indus is conquered by the Persian empire and is formed into two satrapies, Thatagush and Indus.